I don’t know what your weather is like where you are, but in Colorado it is super cold, and snowing. This is an absolute must during this type of weather. Make a big pot, and warm it up with a little cheese on top. yummy! To a 6 or 7-quart slow cooker, add potatoes, onion, chicken broth, evaporated milk and season with salt and pepper to taste. Cover with lid and cook on HIGH heat for 4 hours or LOW heat for 8 hours (poke potatoes with a fork to check make sure they’re soft). Ladle out 2 cups liquid from soup mixture in crock pot into a liquid measuring cup, set aside. In a medium saucepan, melt butter over medium heat. Add flour and cook, stirring constantly, 2 minutes. While whisking, slowly pour 2 cups liquid in measuring cup into butter mixture (it will thicken quickly). Pour butter mixture into slow cooker and stir to blend. If desired, mash potatoes with a potato masher to break down into smaller pieces or use an emulsion blender to puree. Cover and cook on HIGH heat until thickened, about 10 minutes. Turn heat off (or to warm), stir in sour cream. 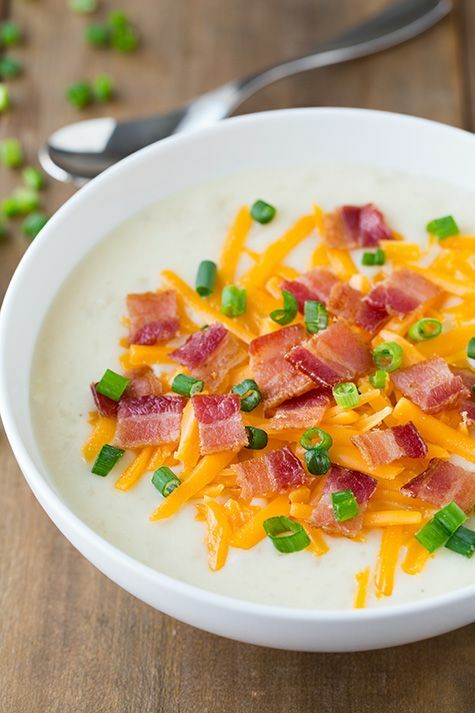 Serve warm topped with cheddar, bacon and green onions (you can just mix in those three remaining ingredients into slow cooker or top individual servings).